A common misconception of many of our patients at London Doctors Clinic is that antibiotics fix everything! In the case of tonsillitis, it’s the task of our private GP‘s to test whether it’s bacteria or a virus causing the infection, before advising on the best treatment options. We run you through the basics of the condition, before focusing on treatment options for tonsillitis! Tonsillitis, or inflammation of the tonsils, is a common condition experienced predominantly by children, teenagers and young adults. Earache and headache-like symptoms are also often reported. Tonsillitis is caused by a bacterial or viral infection and is therefore contagious. As a result, it is important to stay away from public places, wash hands regularly and keep a tissue handy to catch any coughs and sneezes. Okay, so you’ve got tonsillitis. What can your GP do about it? You might think you know some common solutions for tonsillitis, but unfortunately some of these are not as straightforward as you thought. It is true that antibiotics are sometimes a great solution to tonsillitis, but only sometimes. You might know that antibiotics are effective against bacterial infections but are completely useless against viruses. As mentioned before, tonsillitis can be caused by bacteria or viruses; however, the latter is much more common and therefore antibiotics will only be effective in the minority of cases. When tonsillitis is caused by bacteria, it is most commonly group A streptococcus bacteria that are responsible and, in this case, the tonsillitis is also referred to as ‘strep throat’. Bacterial tonsillitis can be effectively treated by antibiotics, with penicillin or amoxicillin being the first choice. However, most cases of tonsillitis are caused by viral infection: a wide range of viruses can cause tonsillitis including rhinoviruses, the viruses responsible for the common cold, and influenza virus, famous for causing flu. In these cases, antibiotics will have no beneficial effect and over-prescribing antibiotics is dangerous as it can promote the development of antibiotic-resistant bacteria, such as the infamous MRSA. So a GP will usually only prescribe you antibiotics if you’ve had a swab that shows your tonsillitis is caused by bacteria. If your tonsillitis is in the majority and caused by a viral infection, your GP will not prescribe you antibiotics. Surgical removal of the tonsils, or tonsillectomy, is only considered as a treatment option for chronic tonsillitis. This means that for your GP to recommend tonsillectomy you must have had a number of documented episodes of tonsillitis in the previous year that are affecting your ability to function normally. Believe it or not, tonsils do actually serve a useful purpose, or else we wouldn’t have them! Unnecessary removal of the tonsils is also discouraged, due to the risks (albeit small!) associated with surgery and anaesthesia. Tonsillitis is also less common amongst adults, so in many cases, bouts of recurrent tonsillitis become less frequent with age. If you are experiencing tonsillitis on a regular basis, tonsillectomy can be an effective solution. However, if you have acute tonsillitis, this treatment option is not available. So, what we’ve learnt from the above two sections of this article is that if you are suffering from an acute case of viral tonsillitis, there is not a lot that your GP can do to help other than advise you to wait it out. In most cases of tonsillitis, the symptoms will last for somewhere between a couple of days and a week and the infection will resolve itself alone. However, there is a lot you can do to support this recovery. Painkillers, such as paracetamol and ibuprofen are recommended to relieve the pain of a sore throat. Some people also report symptomatic relief from gargling warm salty water or an antiseptic solution. It is also important to drink plenty of fluids to keep hydrated. 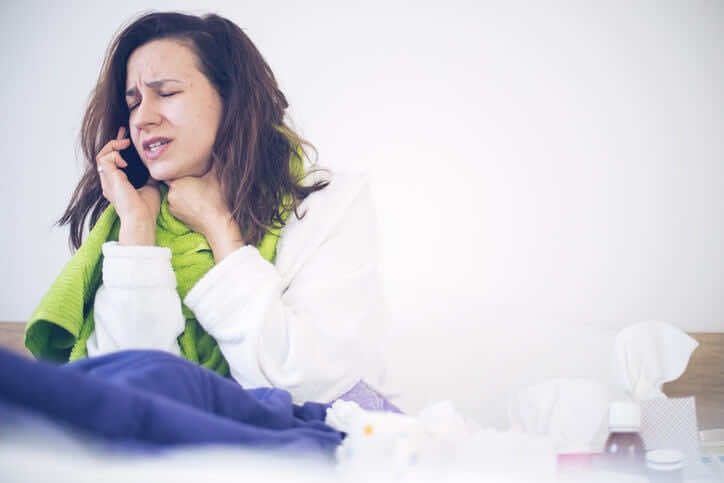 If you think you may have tonsillitis, it is a good idea to see one of our GP’s at any of our nine private clinics across central London – to firstly check that it is definitely tonsillitis you’re suffering from and not another similar condition. From here, your GP will be able to test tonsillitis is bacterial or not, and offer you treatment, if appropriate. Even if your GP isn’t able to offer you antibiotics or surgery to treat your tonsillitis, they can still offer advice regarding symptom relief, and perhaps provide you with that all-important sick note, giving you time to recover.